Occasionally problems surface when traveling - we will try to maintain an account of problems which we believe are pertinent to cruisers and have come from reliable sources. A July 2001 report from cruisers in French Polynesia reported that a Windbugger wind generator unit experienced a catastrophic failure. The assembly to which the blades are mounted, fractured, leaving its collar attached to the shaft, while the hub and attached blades rammed into the support pole and careened into the sea. This dented and bent the support pole. They were extremely lucky that, at the time of failure, the position of the blades caused them to go overboard and not into the cockpit where someone would have been seriously injured or killed. disintegrated, damaging the support and sending potentially dangerous parts flying into the sea. This was a recently installed unit and appeared to be working fine until the moment of failure. Fortunately no one was injured. We have recommended that this failure be reported to SSCA and Practical Sailor to spread awareness of a potential problem. Alert for Americans - September 2001 - In the aftermath of the terrorist attacks on New York and Washington, groups of militants have been roaming streets in Jakarta, threatening to harm Americans if the US attacks Afghanistan. Cruisers could do well to avoid large cities while in Indonesia. Despite some antagonism in 2000 in the major cities, the outlying islands seemed to welcome contact with cruisers. Authorities demanded to see unusual equipment when checking in, including oxygen bottles. Boats arriving at night were charged $US30 overtime even though officials did not come to boat. Official demanded $US170 because he was made to wait for boat owner upon check-in; settled on $60. Johor Bahru - Customs officials impose large fines if passport is not stamped -2001 - There have been several incidents where people's passports were not stamped when traveling from Singapore to Malaysia. When they attempted to leave Malaysia they were subjected to large fines and/or jail time. Langkawi - While motoring around the SW end of Langkawi Island near the island of Pulau Selang, we hit a rock at 6.5 kts. For the full details read the Horror Story - Up on a Reef. The rock is marked on Malaysian charts, but not on some British Admiralty charts (at least the ones issued prior to 1992.) The diagram at the right is for reference purposes only and should not be used for navigation. 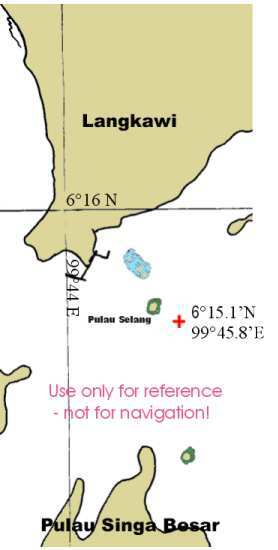 When traveling in that area, please give the island of Pulau Selang a wide berth. Click on thumbnail for full-size sketch-chart.